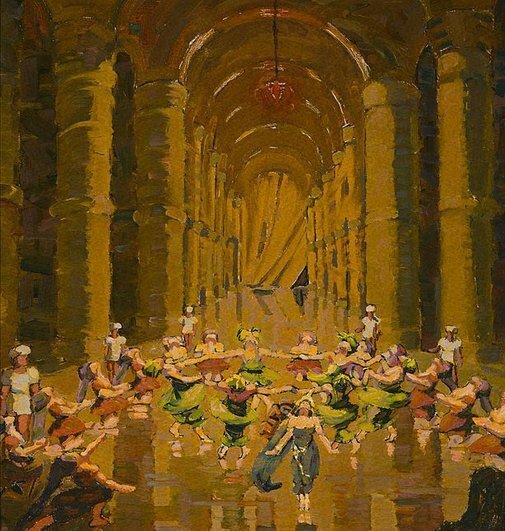 Grace Cossington Smith painted this work following a visit to the musical play 'Chu-Chin-Chow, which was written and produced by the Australian actor-manager Oscar Asche and which broke all records for long running when he opened it in London in August 1916. The play ran until July 1921 when it closed in Sydney. It opened in Australia at the Tivoli Theatre, Melbourne, 11 December 1920 and was presented by Hugh D McIntosh. It travelled to Adelaide, and opened in Sydney at the Grand Opera House on Easter Saturday, 26 March 1921. It was always advertised as "an extravaganza of the Orient". Signed l.r. corner, black ink "G Cossington Smith". Not dated. Deborah Hart, Grace Cossington Smith , 'Cultural landscapes', pg. 56-75, Canberra, 2005, 59 (colour illus.). Bruce James, Australian painters of the twentieth century , 'Grace Cossington Smith', pg. 40-51, Sydney, 2000, 51. Daniel Thomas, Art Gallery of New South Wales Quarterly , 'Grace Cossington Smith', pg. 510-521, Sydney, Jan 1970, 515 (illus. ), 519.